Audio, transcript: The Times released excerpts from the interview, as well as audio here. It's not clear what Trump meant in saying that the newspaper set up Corker, but the transcript makes clear that Corker knew he was on the record, notes CNN. He also knew the call was being recorded, telling the reporter that his staff was recording it, "and I hope you are, too." GOP trouble: At the National Journal, political analyst Charlie Cook of the Cook Political Report writes that Trump went to a "darker place" in his Corker criticism, and he now thinks the GOP majority is in jeopardy not only in the Senate but in the House. "The party needs to sublimate its divisions, get mainstream Republicans to the polls, and persuade the Trump base to cast ballot for non-Trump Republicans," he writes. "That's a tall order. And it's why last week's news reduced the odds of the GOP retaining its majority from a good bet to even money." Ulterior motives? Pascal-Emmanuel Gobry of the Week calls Corker a hypocrite for his sudden public turn on the president and suggests that the retiring senator is positioning himself to be an "establishment" primary challenger to the president in the 2020 election. Now what? James Fallows at the Atlantic writes that if Corker truly believes Trump might blunder his way into World War III, he has an obligation to "do something about it" by providing a crucial check on Trump's actions through his position as chair of the Foreign Relations Committee. "Talk is better than nothing, but action is what counts." WSJ weighs in: The conservative editorial page of the Wall Street Journal thinks Corker spoke the truth about the president's "lack of discipline, short fuse, narcissism and habit of treating even foreign heads of state as if they are Rosie O'Donnell," and it hopes other top Republicans follow Corker's lead because it might actually help. Little reaction: NBC News rounds up reaction from top Republicans to Corker's statements about the president and finds "silence or a shrug." A typical sentiment, from Marco Rubio: "You'll have to ask Sen. Corker what led him to make that statement. I haven't made that statement." Trump's new criticism comes just a week before a Senate vote important to Trump's tax plan, notes the New York Times. I think "Pat Paulsen" would be a better nickname for Corker. If you're too young to know who he was, Google him. 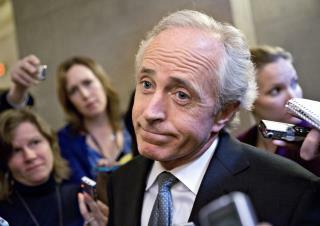 "The conservative editorial page of the Wall Street Journal thinks Corker spoke the truth about the president's "lack of discipline, short fuse, narcissism and habit of treating even foreign heads of state as if they are Rosie O'Donnell," AND Corker is right the EFF on!!! !